This morning I went to work with Amoeba. I helped a bit in the lab by doing the non-science housekeeping stuff so he could do science. I washed beakers and did some general clean up. I also watched him work for a bit and put wax seals on petri dishes for him. At lunch time Amoeba took me to The Hungry Clam. We wanted to eat at Mi Casita, but their winter hours don’t include lunch on week days. When Amoeba suggested The Hungry Clam instead, I couldn’t think of any reason to tell him no, but I thought he was about me make me change my Valentine’s Day dinner plans. He always orders a scallop basket when we eat there — unless we go for breakfast then we both get Eggs Benedict. Much to my joy and surprise, Amoeba ordered a fish sandwich. I wasn’t going to have to spend the afternoon researching new recipes! After lunch I happily took him back to his Fernald Hall lab, and I skipped off to the grocery store where I bought the ingredients for my love’s dinner surprise. Speaking of surprises, Amoeba didn’t want me to pick him up from work despite the occasional rain squall and bellowing, nasty, ice-cold wind. On top of that, he surprised me by coming home an hour early. I had been futzing around and hadn’t finished tidying the house. Still, I was tickled to see him early, even more so when I realized he brought me a puppy! He’s perfect. He’s well trained, but still a puppy and cute as a button! I have named him Love Puppy. And then I cooked the special meal I have been planning all week. I set the table with matching place mats and napkins, my favorite wine glasses and a bouquet of tulips. We had Maryland Crab Cakes as our starter. I’d like to tell you I made them, but the truth is, I bought them frozen from Schwans. I served them piping hot on a ring of cocktail sauce. No photos, I forgot. Sorry. Our second course was a lovely fresh baby spring mix salad with mushrooms, green onion and shredded baby carrot. We drizzled a Balsamic Vinaigrette dressing over it. For our main course we had pasta in Asiago Cream sauce (just make your favorite white sauce and stir in shredded Asiago Cheese to taste. 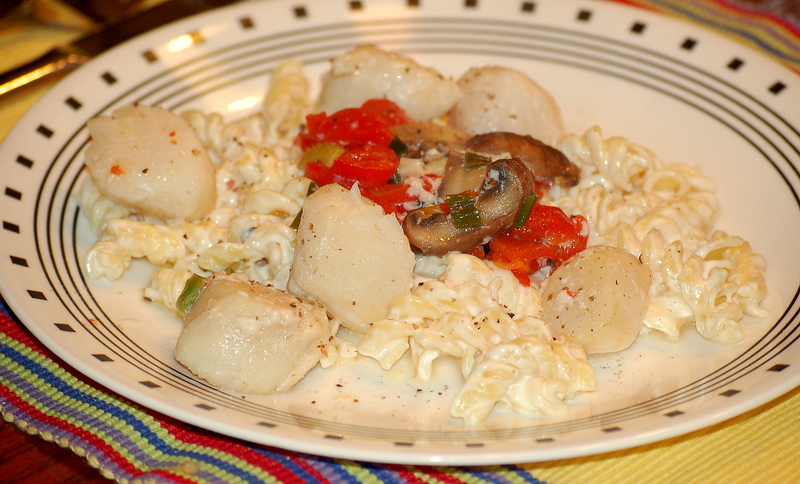 Asiago is quite dry, so make your sauce a tad on the thin side), accompanied by butter sauteed scallops & mushrooms. The meal was a huge success with both of us. It was mouthwateringly delicious. And you’ll be happy to know I remembered to take a picture! Check out the little wooden block above Amoeba’s plate. That was my gift to him. It isn’t as cute as Love Puppy, but I bet it is better behaved! The scallion recipe follows, but I have to warn you, I read recipes as suggestions, so I am going to tell you how I made this, but I rarely measure anything. If you’re a measuring cook, this recipe will likely frustrate you! Sauteed Scallops with Scallions, Mushrooms, Garlic & Roasted Red Pepper. Melt butter in sauce pan, add garlic, scallions, red pepper & mushrooms, sauté for 3-4 minutes, juice should form from veggies & butter. Move veggies to outer edge of pan and place semi–frozen scallops in the middle. Turn the heat to low and put a lid on the pan. Allow scallops to simmer 7-8 minutes. Turn over, simmer 3-5 more minutes, serve over pasta with cream sauce*. *I made my cream sauce with about a table spoon of butter and a cup and a half of real cream, I brought them to a slow boil and stirred in a bit of flour mixed in water to thicken it, then I removed it from the heat and immediately stirred in 1/4 cup (or so) of Asiago Cheese. The recipe I adapted this one from called for dill, which Amoeba doesn’t like so I omitted it. It also called for vermouth, which I didn’t have and didn’t try to substitute anything for. Lemon was also called for — I was supposed to stir in a tablespoon of lemon juice before adding the scallops to the veggie and butter sauce in the sauté. I had planned to do that but forgot. That is probably just as well since I used cheese instead of dill. ← Vaya Con Dios, Vicodin! Cherie — thanks. It was a special day from beginning to end and I love my little puppy. You are amazing, Quilly. I can easily see why Amoeba loves you so much and you him. This was so sweet. It made my heart happy to read this. Thanks, Kay. I often feel the same when reading about you and Art. I bring her a puppy, she brings me life. Woof! Amoeba — I love you. You are my heart. This is the best comment I have EVER EVER seen on this site. Well done, sir. Your dinner looks delicious! Looks like a Valentines day success. 🙂 I´m a measuring kind of cook, so I won´t try this. Love the puppy you got. So much cleaner, than a real one. Betty — dinner was delicious! I am always reluctant to share my modified recipes because I never measure. Aww….Love Puppy is adorable and as you said, perfect. That pasta dish looks delish! We are seafood lovers in general around here and scallops are one of our favorites. I’ll have to give it a whirl. Stacy — If you try this dish I am sure you will like it. Amoeba just happily took the leftovers away in his lunch sack and was anticipating noon while eating his toast this morning. This all sounds so unbelievably sweet. Violet — it was a very sweet day. Probably my most perfect Valentine’s Day yet. Looks and sounds like quite a fun day. I guess Punny Monday was off on a date?! Linda — I was so excited about my Valentine’s Day plans I totally forgot it was also Monday! Karen — I don’t really want a real dog. I would love one to play with and cuddle, but I am not up for the work aspects of pet ownership. Love Puppy is perfect for both me and the lease. We had seafood bisque for dinner yesterday. I guess seafood and Valentine’s Day go well together. SN — I guess seafood and Valentine’s Day do go well together! Congrats on the new puppy! Such a perfectly adorable choice. Bev — yes, and Amoeba’s work requires he travel often. I do like to go with him so Love Puppy is the perfect pet. forgot all about valentines day waiting for punny mundy! oh well, even though i forgot valentines day, i did eat too much candy, and soda! i did get the card and flowers you sent! thank you! Tilden – -and I forgot all about Punny Monday in anticipation of Valentine’s Day! Wonderful gifts and wonderful dinner! Wow! Couldn’t ask for anything else. Gigi — I am content. 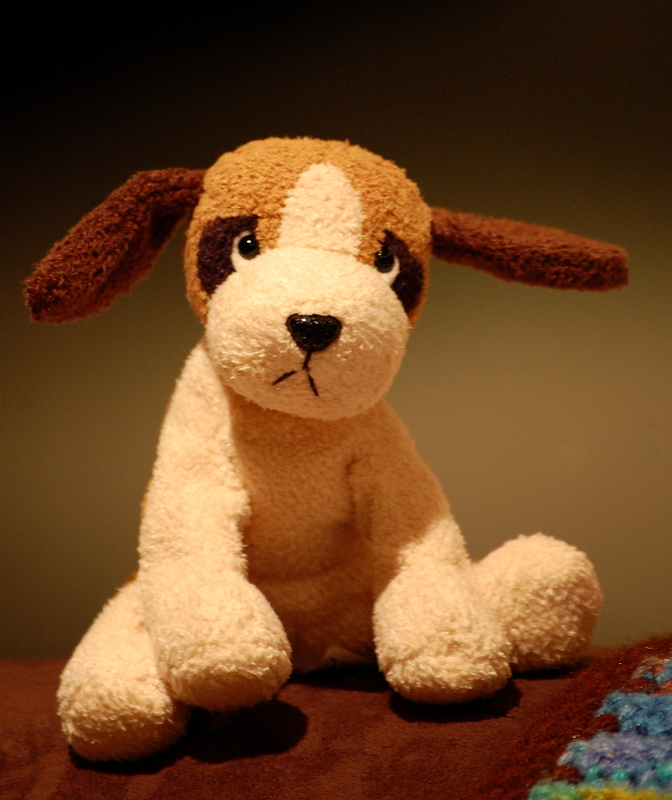 Love Puppy sounds ideal — no dog hair, bad smells, “accidents,” vet bills. etc. Love the little plaque! I’m not a big seafood fan — I eat fish so infrequently that I forget what kind it is I like. My favorite used to be served by a restaurant called Po’ Folks and then later just Folks — we joked that they must not be po no mo, but then they closed. 🙁 Currently my favorite is Red Lobster’s popcorn shrimp…though it’s not terribly healthy, I imagine. Don’t have it often, though. Sounds like a lovely Valentine’s Day! Barbara — I am more of a fish fan than Amoeba, but he introduced me to scallops. They are among his favorite foods. They are quite mild and don’t have a fishy taste at all. Better yet, they don’t have bones! Awwwwww…. You guys are so romantic. I love it! Love Puppy is adorable. Raven — my Amoeba is consistently loving and I find that very romantic. He is definitely my blessing. That looks mouth-wateringly divine! And the puppy is adorable! Love puppy is the perfect pet! lol. You had me going there for a minute and I quickly scrolled down to see the photo. Realistically, a real puppy “sounds” good, but they certainly are ALOT of work and commitment. Your scallop recipe sounds delish. 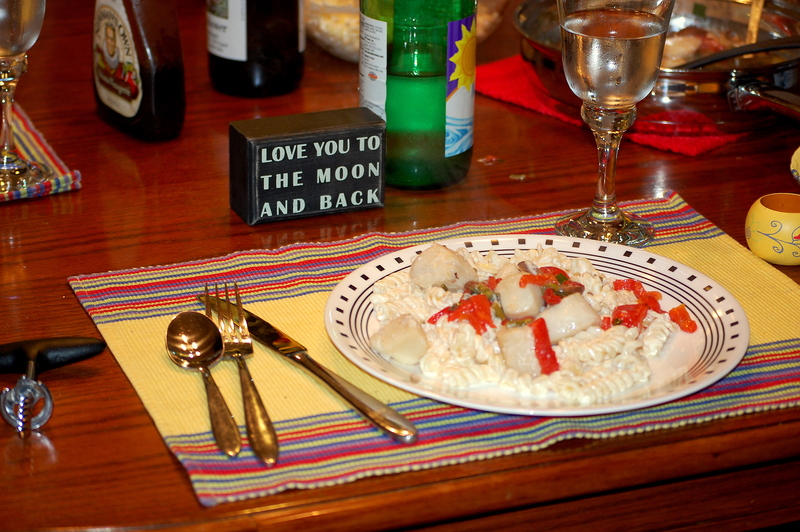 I have never made anything with scallops. But I do like them, so I may have to try it. So glad you and Amoeba got to spend some good quality time together this Valentine’s Day. p.s. I too made a seafood dish for FW (shrimp scampi). I didn’t like the way it turned out. At least FW didn’t complain. God knew what He was doing putting you two together. A match made in heaven, indeed.